Artwork Panel: 28.2cm x 41cm ≈ 11" x 16"
This Japanese woodblock print reproduction features an actress (Geigi) or Geisha standing on a veranda, facing left, with several hairpins; behind her. Across the courtyard, are the silhouettes of persons in an illuminated room. 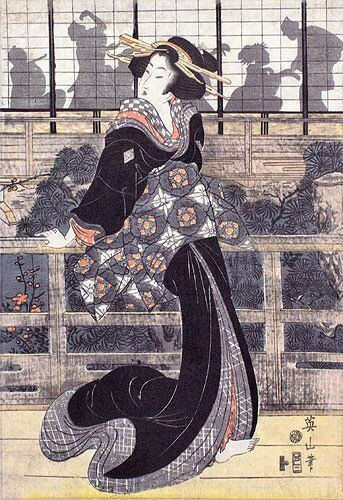 The original woodblock was carved/created in Japan, between 1809 and 1813.